Psalm 119:97-104 // מ Mem // Sweeter than Honey! “97 Oh how I love your law! Read this section of Psalm 119 again, but a little more slowly, listening to the heart of God being unfolded in the heart & mind of David. Read it a third time, bit by bit, line by line and listen to the heart of God speaking to your own. Read it a fourth and final time, and make it your prayer. In today’s world, it seems that people outside of Christ have taken it upon themselves to begin judging what we who follow Him can or cannot do. They want to dictate to us what is acceptable for us and in doing so force us to conform to their patterns of behavior. But here we see a man, Gallio, outside the church, outside the Judeo-Christian ethic & he understood that it was not for him to judge what they did or did not do within the sphere of their religious practices. 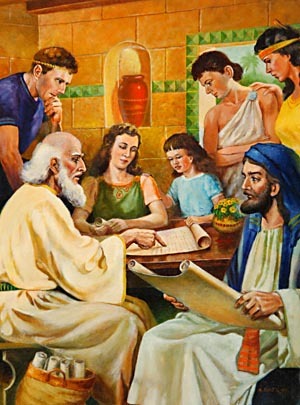 If Paul had been disruptive, violent or unlawful, then he would have begun a conversation with them. But he understood the boundaries and where his opinion was needed and where it was not. Secularists in our world today are not quite so restrained in their opinions. As Christians, though, it will always come down to obedience to God above all else. Paul reminds us elsewhere, on more than one occasion, that we are to obey the governing authorities. They have their positions for a reason. God is a God of authority & order & so we should comply to help support & maintain that understanding, especially where our witness shines to those outside of Christ. But when it comes down to the line, we follow God with no hesitation or apology. We are bound to Him & His will far beyond the social pressures of secular society. Kim Davis’ stand for her beliefs is one such example, but there are so many more around the world that suffer deeply for their faith in Christ. Both examples are meaningful, and all of our examples together build the reputation of the Church & for Christ in this morally compromised & compromising world. So, yes, render to Caesar, honor the king & be a good citizen. But understand where the line is drawn between civil authority & moral authority & don’t let the human side win out over God’s. Compromise in faith is more than just a slippery slope, it is stepping away from truth. Stand with God first and foremost and let Him be your guard & guide as you bear witness for Him & GoLove others in His Name. Stand firm then, in Christ, and be true to what God has laid out for us in the unwavering truth of His Word. It’s not going to be easy, but most things worth doing rarely are. What a wonderful message for Paul to receive! I think we could all stand to be reminded of that crystal clear message. God has given us each a purpose, a deep, bigger-than-us, meaning for life and He confirms that by being present with us through it all. When we try to stand on our own, using our own strength, being ‘persuasive’ with our own wits, and trying to reason things out by our own ‘wisdom’ we are going to find futility, sorrow and disappointment. But when we find ourselves occupied with the Word, trusting in God, then we will see with new eyes and find a beautiful vista laid out before us. It’s not an easy one to traverse, but it is certain. The goal is Christ, the path is Christ and the Word stands as our sign posts along the way as the Holy Spirit gives us wisdom to comprehend the journey, step-by-step. Sometimes the Gospel is presented once and 3000 people come. Sometimes it is through the plodding of the days, weeks, months and years that we see its seed planted, watered and harvested. Either way, we find our contentment in doing that work, trusting the Master’s hand. Summits a season will come to a close, and we go on to speak to others who want to hear, who want to experience wha God is leading them to do. Sometimes it is a journey that does not move locations, but rather takes place over time in one, single place. And for us, the servants, it is not to say where the work needs to be done. We trust in the Master, and we listen to His voice. We trust that He is with us in the easy times and in the difficult. He has promised us that He would be with us, and so we must rest in that faith He has given us. I would love to tell everyone that ministry is easy, and always trimmed out with joys. But in reality, it is difficult. There is heartbreak. The struggle with sin becomes burdensome when you want to flip a switch in someone’s head and heart that won’t be flipped by any power I can muster. We learn to wait, we learn to trust and we seek out God’s will in the fun and in the perilous times. Our joy then comes from His presence. Our hope is manifested in Him. Our weaknesses shout out our need for Him and in those moments, where we feel His hand leading us through situations that we would never have thought we could face, we find true contentment and peace. As we GoLove others in His Name, in His power and according to His will, we will find that joy and contentment only in Him. Seek His face. We are so often tempted to look at the task of discipleship and see the whole picture at once. That is an overwhelming task to try to begin! Looking at all the people that need to meet Jesus, all those souls who stand apart from the joy of the Gospel, we see the task laid out before us and we instantly begin thinking about how there is now way we can handle this enormous undertaking. The harvest is indeed plentiful! But we look at it with the eyes of the worker, and not the eyes of the Master who has given the work, and in doing so, we find ourselves struggling with the very idea of beginning the work. And in that state of mind, man y Christians set aside the power given to us in Jesus Christ, and we settle for complacency, consumerism and apathy sets in where glory should reside. In reality, we see what Paul does here in Acts 18 and it sounds so simple, it sounds too easy. Just meet with friends? Just talk with people out at the stores & shops as your day unwinds? What about the crowds, the times where “3000 were added to their number that day.” and other situations like that? Doesn’t sharing the Gospel look like that? Powerful speakers, big voices, great intellects? That’s what makes for an effective Gospel presentation, right? Wrong. We more we acknowledge our weakness, the more God shines through. The more we see and understand that the infinite, all powerful Creator of the Universe puts His Holy Spirit into us, into our regular, daily life selves, the more we will come to see and understand that the best discipling happens in these quiet, small, one-on-one situations, rather than in the big and the grandiose. Sure, some people are drawn by the crowds, and they get saved in the midst of large efforts. But the bulk of the population of heaven will be there because 1 or 2 people sidled up next to them somewhere along life’s journey and witnessed to them for the sake of Christ in small, private, daily-life kind of ways. There is beauty and power in the simple communication of the Gospel. There is power in the Gospel, and we must remember that God did not send us out inadequately equipped. Instead, He gave us Himself, through His Holy Spirit, and we can stand in all confidence in that message and in that process of discipleship because of what He has done. It is all for His glory anyway. Trust Him. Take those simple steps of faith today and begin a conversation about Jesus with someone. You don’t have to have all the answers, you just need to be willing to be used by Him for His glory as we GoLove others in His Name. Wisdom begins in us when we learn to fear God properly. Understanding grows in us when we gain a proper perspective as to who we are in light of just who He is, too. We cannot have a healthy perspective on life so long as we see ourselves at the top of the ladder of importance. Instead, with a dose of humility and an honest evaluation of reality, we see just how much we need God, His love, grace, mercy & His rule over our hearts, minds and lives. Pride has no place before the throne of God. 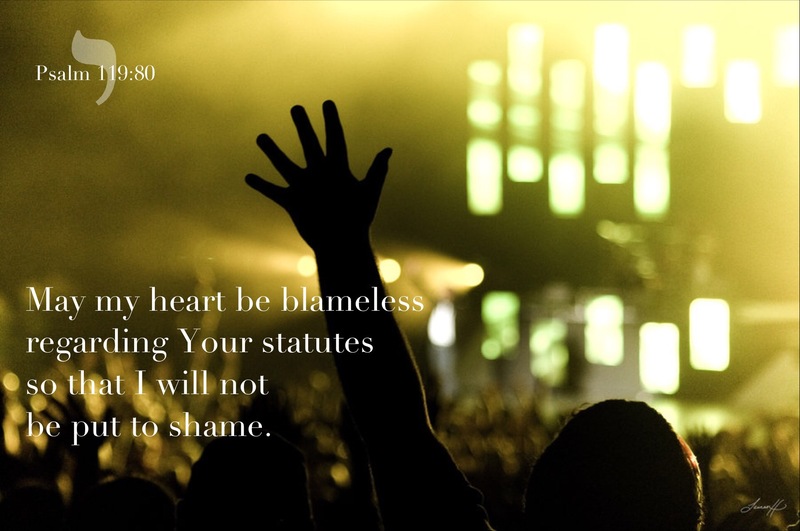 Read this portion of Psalm 119 again, a little more slowly, taking in the depth of what David is saying & admitting. Read it a third time, acknowledging your own need for God’s guidance. Read it a fourth and final time, and make it your prayer as you see Him out. 24 Because we have heard that some without our authorization went out from us and troubled you with their words and unsettled your hearts, 25 we have unanimously decided to select men and send them to you along with our dearly loved Barnabas and Paul, 26 who have risked their lives for the name of our Lord Jesus Christ. 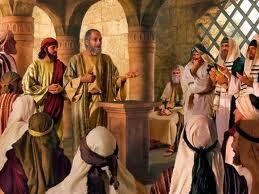 27 Therefore we have sent Judas and Silas, who will personally report the same things by word of mouth. 28 For it was the Holy Spirits decision — and ours — to put no greater burden on you than these necessary things: 29 that you abstain from food offered to idols, from blood, from eating anything that has been strangled, and from sexual immorality. You will do well if you keep yourselves from these things. If you have never had the joy of packing up and moving to a new location, then you have never had the unusual perspective given by physically laying hands on everything that you ‘own’ in a short amount of time, getting to evaluate it, getting to count it, to see how much space your stuff takes up in a moving truck or a storage space. It always makes me want to just get rid of it all and start over because I see just how much baggage I have accumulated, and just how much nonsense gathers around us. Here in the West, we have so much, too much. But we also seem to want to surround ourselves with even more as time goes on. For some it even becomes an obsession, in dealing with loss or grief or change, they gather and hoard and hem themselves in with more and more trying to physically fill in the space that they are emotionally struggling with…it is a cultural disorder. So, When these new Christians hear about the simple joys faith, and hear about freedom that God offers in Jesus Christ, they are overjoyed and rightfully so. It is like waking up in the middle of your hoard and finding freedom to walk away and not need those extras anymore. It is like having your eyes opened up for the first time, someone taking lead boots off your feet. It is the sweet release of freedom that only can be brought to you by someone else, like a prisoner being unchained and their door being left to swing wide. But then they meet people who have already been ‘free’ for a while, and they are given a suitcase, and maybe a backpack loaded with all the extras that they ‘must have’ in order to enjoy their freedom. They are loaded with expectations and arguments, with to-do lists and burdens that were never meant to accompany their freedom by the One who gave it to them. And in time, they are expected to fall in line with everyone else. Let the excitement wear off, get in step with reality, and polish the edge off that joy a little and THEN you will see what it really means to be ‘free’ like me. These new believers were being loaded up with extra burdens, extra ‘joys’ that were not joyful from any angle of observation, and told that the freedom that had been purchased for them came with a few extra…caveats, that they needed to understand and carry along for themselves. (I hope this sounds incredibly familiar for us today.) And when they groaned under that burden, the church stood up, prayed, consulted Scripture, and stated that they were indeed allowed to enjoy their freedom to the fullest extent of the word. There were not going to be any rules that did not point their hearts toward God and God alone, or attempt to replace their new identity in Christ. And so when they heard the good news, that ‘freedom’ really meant FREEDOM like they had hoped, then they rejoiced, as we all should. So, as you GoLove people like Jesus does, don’t bind heavy burdens on their backs, hearts and minds. Instead, show them that when we are free in Christ, we are free indeed!